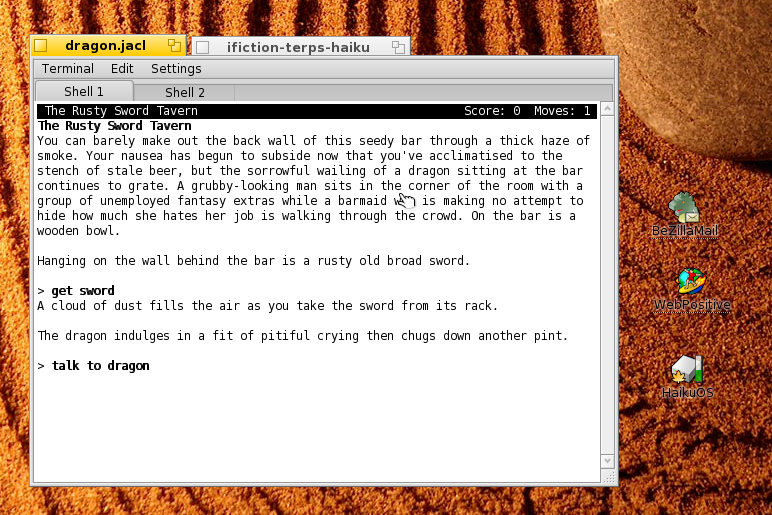 Some command lines tools for running Interactive Fictions games, also known as textual adventures, for the most commonly used gaming systems. Download this package and unzip it on the desktop. You can also drag and drop game files onto the ifiction.sh icon to automatically start the game with the correct interpreter. A z-machine interpreter for Infocom and Inform systems. frotz is for reading z3, z4, z5 and z8 games. 'nitfol' is another z-machine interpreter, which can read zblorb files (but not the cover arts inside them). Some glulx interpreters for Infocom and Inform systems again. Glulxe is for reading blb, ulx and zblorb games. Git can read the same formats as Glulxe, but it's supposed to be faster. 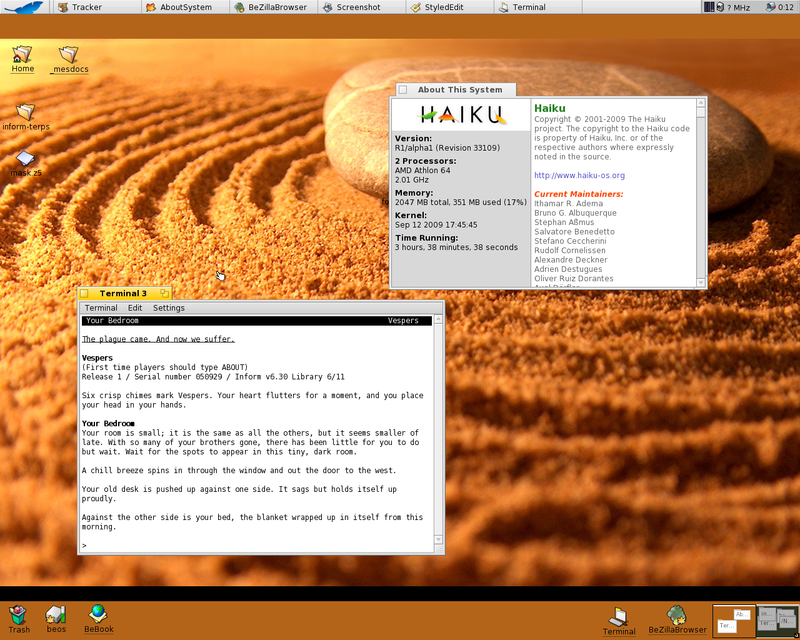 The glkterm versions should display better but there are some issues with accented letters in some languages. Frob is the tads2 and tads3 interpreter for .gam and .t3 files. More on Tads on the ifwiki page. 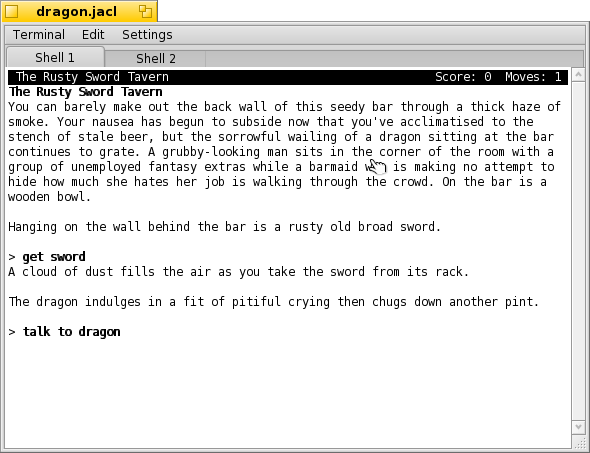 'jacl' is an interpreter for the JACL game system. 'he' is the Hugo interpreter for .hex games. More on Hugo on the ifwiki page. 'arun' is an Alan interpreter for .acd games (v2 only). More on Alan on the ifwiki page. 'magnetic' and 'level9' are interpreters for the commercial games from Magnetic Scrolls and Level 9. They are only using cheapterm for the output (no status line, and line break may occur in a word).